It started out as a useful hack. Now, it’s changing the way industries identify hazardous chemicals. Ian Burgess, the CEO of Validere Technologies, was working on his PhD at Harvard University when he developed materials that revealed colour patterns that were sensitive to the different physical and chemical properties of a liquid. Initially, he was just using the technology to identify chemicals in old vials that had been left in the lab. The other use for the material was to put it on the inside of shot glasses to make logos appear when different types of liquids were poured in. He had no idea that his invention would turn into a company. The Validere Identifier is a portable device that is able to provide information about any liquid instantly. Chemicals are tested with the indicator material, which is then imaged and analyzed by the reader. With the same user interface and functionalities as a cellphone, the reader reveals the key properties of the chemical, which allows the user to characterize the chemical and handle it safely. After the details of the invention were first published in a journal, it received interest from several different companies and industries. Through that process, it became clear that there were commercial uses for the product. Nouman Ahmad, now the president of Validere, soon joined Ian to start the company. It wasn’t until the Lac-Mégantic rail disaster in July 2013 that they realized reliable and cost-effective chemical testing was a real issue with a market need. “There was an inflection point and, in our case, us believing in the technology’s commercial potential was probably the biggest step that got us to say, with all the families and everything else, we’re going to take a risk and start a company,” says Nouman. That was the beginning of a long, iterative process trying to figure out which idea actually made the most sense and the best vehicle with which to commercialize the technology. 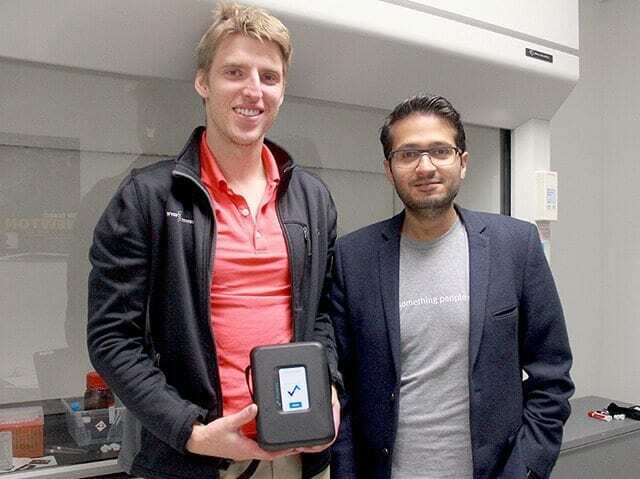 After raising two rounds of funding, Ian and Nouman are now focusing on scaling up the three components of their technology: the hardware, the software and the science components. 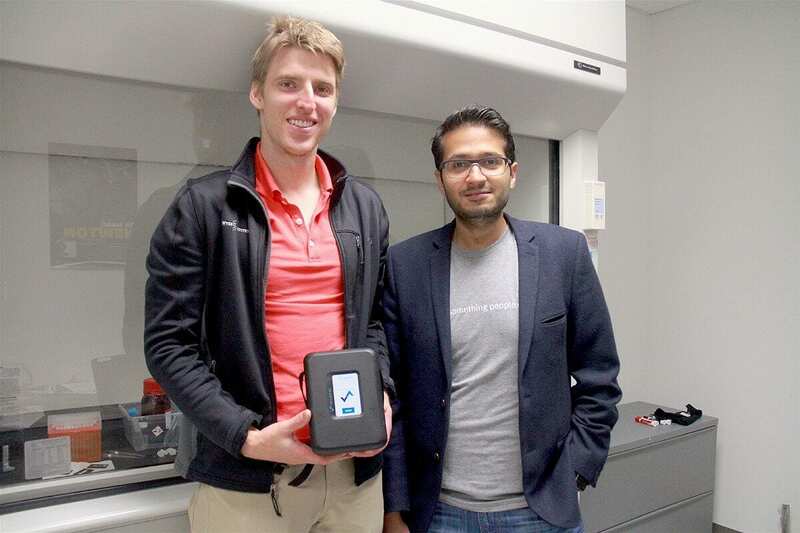 Moving forward, their challenge will be creating a device that reflects customer feedback. For Ian, an interdisciplinary scientist, making chemical testing accessible is more about using information efficiently than it is about the actual chemistry. Lab-quality analytic instruments are not accessible in the field because the instruments have to be portable and use information efficiently. The team decided to focus their efforts on thinking about the information flow. By basing the reader on a phone, they’re able to outsource the hardware and focus on developing the core values, the chemistry and the software. Their biggest mistake was letting their customers define their market strategy. “We followed where we had the most customers on the table and that tended to be the place where we also had the least leverage to make money,” Ian says. They have since focused on seeking out their customers and being thoughtful about how they will create value for the market. For more than a year, the two worked day jobs and spent their evenings and nights building Validere. When they finally quit their jobs, Ian’s daughter was three months old and Nouman was planning his wedding. Coming from two very different backgrounds, it took the pair some time to adjust to being entrepreneurs. Ian believes that you have to do everything you can to keep all doors open and to be opportunistic in career planning. “The idea that I’ve built something valuable becomes the biggest impediment to me doing something that really creates value because I have this idea that I have something to lose,” he says. The company started with just the two of them and initially relied on co-op students for staffing. Today, the team has grown to eight and they’re in the process of hiring more full-time staff. The company is currently getting ready for the first public launch of the product, which they expect to happen by the end of 2016. In the next five years, Ian and Nouman hope to grow Validere into a multi-million-dollar revenue company and expand to a few hundred people. In the meantime, they’re focused on continuing to scale up.